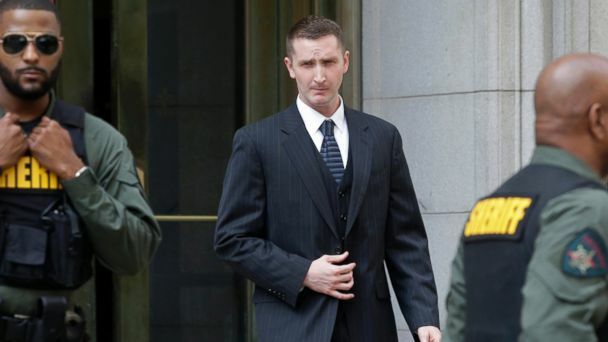 The judge determined that prosecutors had failed to prove its case, including that Nero detained and handcuffed Gray, based on the testimony of fellow Baltimore police officer Garrett Miller, who said he acted alone in handling Gray. Miller, who is also facing charges in Gray's death and has pleaded not guilty, was granted immunity in Nero's trial, so his testimony will not affect his own upcoming trial. Moreover, the court said that Nero had "probable cause" to touch Gray and that any contact between the two men was "not unlawful and unwarranted." The Baltimore Police Department said in a press release after the verdict that "although the criminal case against Officer Edward Nero has come to a close, the internal investigation has not. With that, Officer Nero's status will remain unchanged. He will remain in an administrative capacity while this investigation continues. The internal investigation is being handled by other police departments. The internal investigation will not be completed until all of the criminal cases against the other five officers are completed because they will likely be witnesses in each case." Nero's lawyer, Marc Zayon, responded to the verdict in a statement. "Nero, his wife and family are elated that this nightmare is finally over. The State's Attorney for Baltimore City rushed to charge him, as well as the other five officers, completely disregarding the facts of the case and the applicable law," he said. During the case, prosecutors argued that Nero had no regard for Gray's safety and was reckless by ignoring policing rules when he failed to place a seat belt on Gray, who was placed on his stomach in shackles in the back of a police transport vehicle. However, the court found it reasonable to believe that the driver of the police transport van is also responsible for belting in a passenger. That driver, Officer Caesar R. Goodson Jr., faces the most serious charges, including second-degree depraved-heart murder. Goodson has pleaded not guilty. Williams grilled prosecutors during closing arguments last Thursday, questioning whether a crime was in fact committed by Nero. "So, every time there's an arrest without probable justification, it is a crime?" Williams asked. "We believe that the search and arrest without justification are assault, your honor," Deputy State's Attorney Janice Bledsoe responded. "There's no question about that." Legal experts say the tone of Williams' pointed questions during closing arguments gave an indication it would be an uphill battle for prosecutors to win their case against Nero. The verdict comes more than a year after Gray's death, which became a symbol of the black community's distrust of police and triggered days of rioting and angry backlash from community members. Zayon said that his client's actions were completely legal and protected by the law and that the state's case against Nero is "nonsensical." "I can't believe I even have to argue this," he said. "The detention is OK, the cuffing is OK, the moving is OK," he said. "Being detained is a horrible thing, being cuffed is a horrible thing ... but the law allows it." Public officials, including Cummings, called for peace and respect for the rule of law after the verdict. "Whatever may be Judge Barry Williams' decision with respect to Officer Nero's role in the death of Freddie Gray, that verdict will have as much legitimacy as our society and our justice system can provide," Cummings said last week. "We will respect the decision."